In 1930, Italian racer Tazio Nuvolari — wearing his atypical yellow jersey and blue pants — battled arch rival Achille Varzi in the classic Mille Miglia (1,000 mile) motor race. Varzi, a fellow Italian, had been told repeatedly at each control point that he was comfortably in the lead. The dark of night still encompassed the Italian countryside, but with morning fast approaching, Varzi felt the race was his. After all, there were no headlights visible from behind. He was out front, all alone. Nuvolari, catching the complacent Varzi, had switched off his headlights. He tore through the public roads near Bologna at speeds of over 93 mph, reeling his rival in with every passing mile, despite the perils of darkness. One might assume that manhandling an Alfa Romeo 6C 1750 GS Spider Zagato in the pitch black of night, sleep deprived and coated in oil and bugs, would be, well, distressing. But not “The Flying Mantuan.” Nuvolari was afraid of nothing. This is in part because Nuvolari was pre-Formula One, so his 24 Grand Prix victories lack the same notoriety. Still, five wins at the Coppa Ciano, two at the Mille Miglia, two victories at the Targa Florio, two RAC Tourist Trophies, a 24 Hours of Le Mans victory and a European Championship speak to the talent of this effervescent Italian. 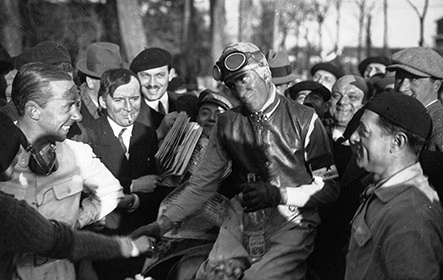 Prior to his four-wheeled accolades, Nuvolari began racing on two, where, naturally, he was blindingly fast, netting a 350cc European Championship in 1925. That same year saw him test the Alfa Romeo P2 Grand Prix car at Monza. 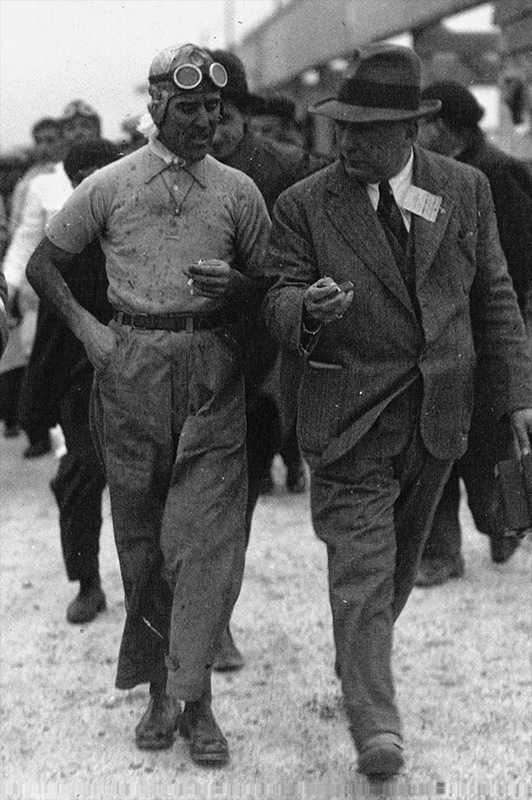 Attempting to impress by besting regular driver Antonio Ascari’s time, Nuvolari crashed heavily and was thrown from the car, sustaining numerous fractures and lacerations. Doctors informed the intrepid Italian that he’d be bed-ridden for a month. And yet less than a week later, bandaged in a fixed riding position, Nuvolari competed in the National Grand Prix motorcycle race. Due to the plaster corset he wore, he was unable to support himself on the bike, relying on his mechanic to keep him upright on the grid and during pit stops. And yet he claimed victory that day, snatching the lead in the closing laps. He then proceeded to pass out due to the pain. And the tales don’t stop there. He once threw himself out of a burning race car at 99 mph, breaking multiple bones in his body. In 1936, against doctor’s wishes, he conducted a daring escape from a hospital to compete in a race the following day, once again donning a plaster corset. And as rumor has it, during the French Grand Prix, he even grabbed a joint of ham from a butcher’s smashed window. Perhaps his most prolific tale came during the 1948 Mile Miglia. First, the hood flew off his race car at speed, narrowly missing his head. Nuvolari’s passenger (it was mandatory to have one back then) was, understandably, alarmed. The Italian tried to comfort his companion by assuring that this was actually a good thing: “The engine will cool more easily,” he said. Next, Nuvolari’s seat came loose. He nonchalantly threw it out, replacing it, as one does, with a sack of lemons and oranges sourced from a nearby shop. 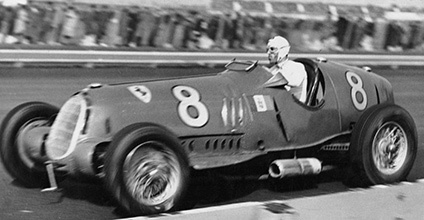 Racing a hoodless Cisitalia 202 SMM, perched on a bag of fruit, Nuvolari continued, despite the team pleading for him to retire. The car would continue to fall apart as the race continued, and yet the Italian star would not give in. In the end, it took dramatic brake failure to force his retirement, such was his will to win. With Nuvolari, though, it wasn’t all theatrics. His greatest victory arrived in 1935 against Nazi Germany, driving an underpowered Alfa Romeo Tipo B. The Nazi government were in attendance at the Nurburgring Grand Prix that day, and with five Mercedes and four Auto Union machines competing, a German victory was all but assured; no other cars were capable of keeping pace, especially the little Alfa. 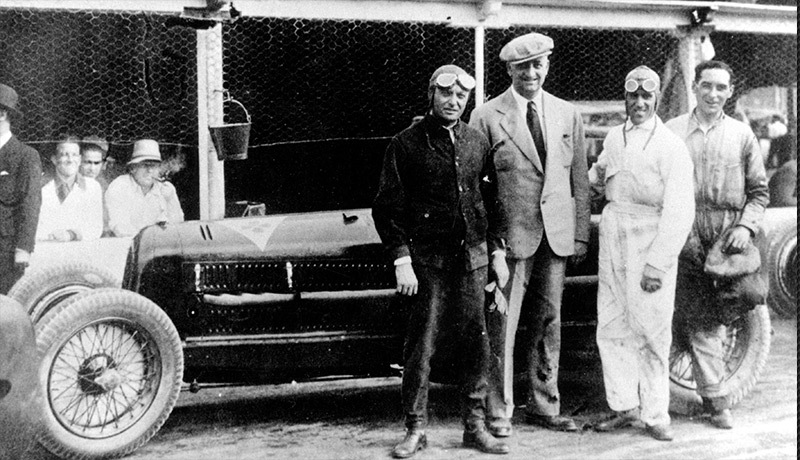 Except Nuvolari—the “inventor,” Enzo Ferrari once said, of the all-wheel drift—didn’t care what people said. In many eyes, this ranks as the greatest victory of all time. Nuvolari’s career effectively ended when World War II broke out. He did return post war, but severe asthma—a product from years of inhaling exhaust fumes—meant that his performances suffered. Nuvolari had publically said he wanted to die at the wheel of a race car, such was the man. Having spent his life dancing with death, what sealed his fate was actually a stroke in 1952, leaving him partly paralyzed. The following year, he passed away in his bed. Nuvolari was arguably the most courageous racer to have ever lived. His accomplishments certainly rival that of Senna, Fangio and Schumacher—without question the greatest of his era. 55,000 people lined the Mantua streets during his funeral, with Fangio, Alberto Ascari and Enzo Ferrari one of the many laying him to rest. Even Varzi would likely agree. In the death of night he crept up from behind during the 1930 Mille Miglia—the Alfa’s headlamps off to prevent his nemesis from noticing. 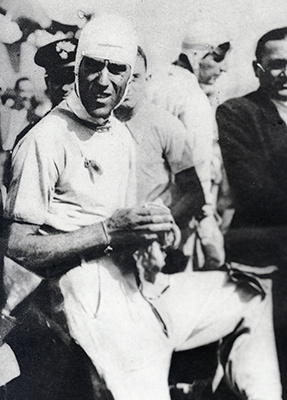 Nuvolari caught his teammate with just three kilometers to go. At which point, he switched his headlamps back on, made a daring pass, and tore off into the distance.